Few months ago, the Large Hadron Collider (LHC) in Geneva woke up from a long shut-down phase. It is now operating at a centre of mass energy of 13 TeV (it might reach 14 TeV in the upcoming phases). This is the first time in the history of humanity that particles are collided at such high energy in a machine built by humans. 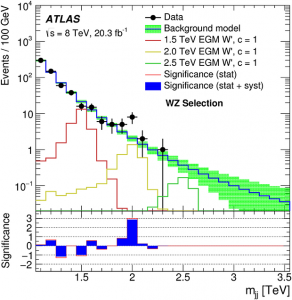 Thus the Run II of the LHC is just starting and is lifting once again the excitement in the particle physics community. 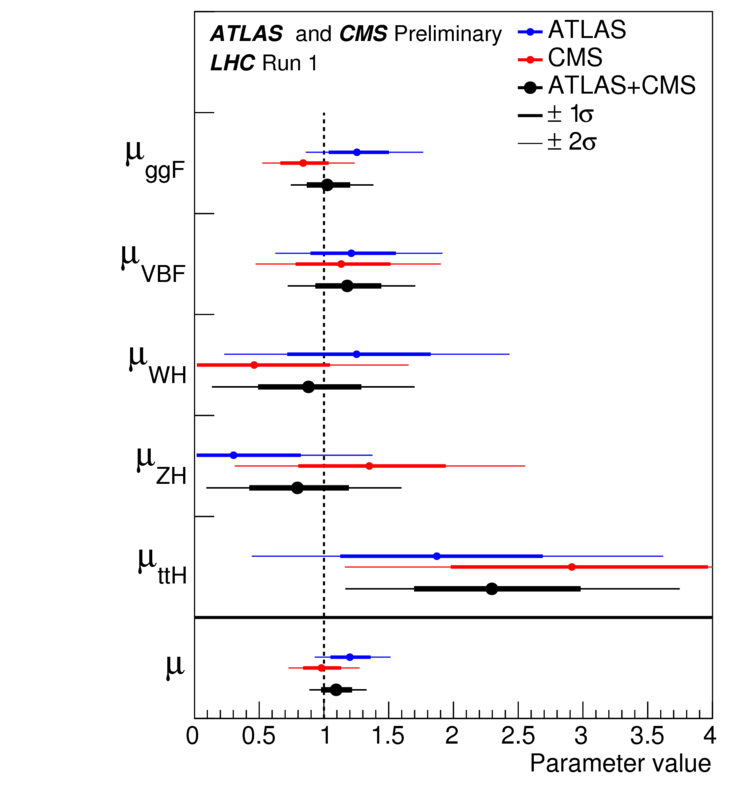 It is thus the right time to discuss what particles or theories could be discovered by the ATLAS and CMS detectors. In this spirit, a topical workshop organised by the Munich Institute for Astro- and Particle Physics (MIAPP) has been held in Munich: “Anticipating Discoveries: LHC14 and Beyond” from the 13th to the 15th of July. 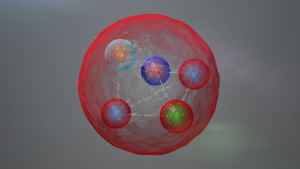 In the last few days, the so-called pentaquark has been claimed to be discovered by the LHCb collaboration. This is an extraordinary discovery but the particle physics theorists are after another kind of particles. Indeed this pentaquark (a composite object made of 5 quarks, see picture to the right) has been predicted many years ago by quantum-chromo dynamics (QCD) but has never been observed so far. What theorists are looking for are theories beyond the standard model. These are introduced to explain experimental and theoretical problems. In general, these predict new resonances or effects that can be traced by experimental collaborations. During this workshop many theories or extensions of previous ones have been proposed. In particular since the discovery of the Higgs boson, extensions of the Higgs sector are under high scrutiny. The beautiful theory of supersymmetry which predicts a special relation between bosons and fermions is still greatly discussed. In particular extension of its minimal version have been proposed. Finally, as we know there is a huge amount of unexplained, invisible matter in our Universe, the so-called Dark Matter, it is justified to propose myriads of models that could explain various anomalies. In particular during these three days, several theories involving a non-abelian structure of the dark sector have been presented. These have a particular phenomenology at very different scales and are currently being tested against observations. During this workshop many theories have been discussed and all theorists are craving to find signs of their favourite theory at the next LHC run. The kind of signs they are looking for is similar to the one reported by the ATLAS and CMS collaboration. The experimental collaborations have made public an excess in the Z/W channels (see picture on the left) and especially in the one where the gauge bosons are decaying into two jets. Future will tell us whether this is a sign of hope and the beginning of a new exciting hera. PhD student Mathieu Pellen reports from a dark matter workshop in Zaragoza. The quest for the understanding of dark matter is certainly one of the greatest challenges of the 21st century. It is thus an extremely hot topic in the particle physics community. 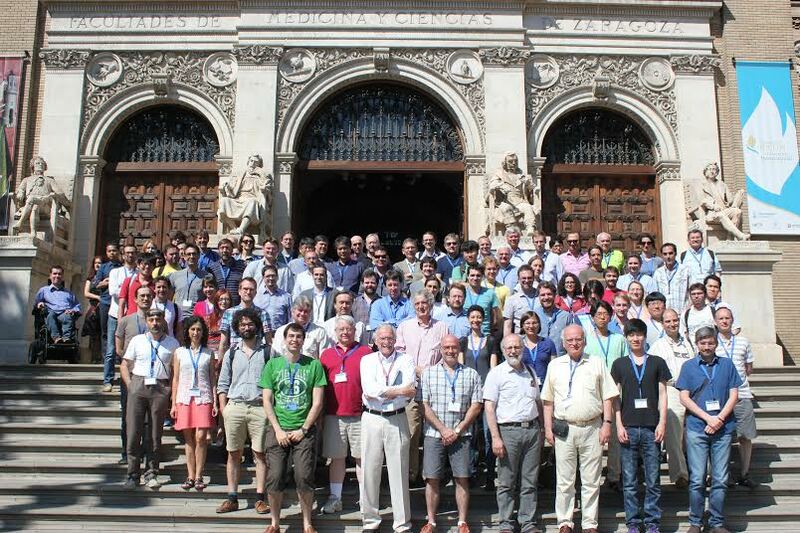 The 11th Patras Workshop on Axions, WIMPs and WISPs has been held in the beautiful and hot city of Zaragoza (Spain) (21-26 June 2015). As the title indicates, the focus was on dark matter and more particularly on axions. Axions have been originally proposed to solve the strong CP problem. They are light particles (of the order of an electron-Volt or even lighter). These can be detected in light-shinning-through-wall experiments or in low background underground laboratories like the one of Canfranc (which has been one the highlights of the conference). During the conference, several innovative experiments looking for axions, axion-like particles or dark photons have been presented. New mechanisms predicting the existence of light particles have been also proposed. In addition to light particles, Weakly Interacting Massive Particles (WIMPs) are the best motivated solution to account for the dark matter observed in our Universe. WIMPs are studied in three different ways: the first is their production at collider experiments such as the Large Hadron Collider (LHC, Geneva). The second is the detection of nuclear recoils produced by dark matter particles scattering on heavy nuclei in underground facilities such as the Grand Sasso laboratory in Italy. Finally, when two dark matter particles annihilate in the galaxy, they produce cosmic rays of standard model particles. These can be detected in satellite-based experiments such as the Alpha Magnetic Spectrometer (AMS-02, partly built at the RWTH Aachen University) on the International Space Station (ISS). My contribution to the conference focuses on the last possibility. I have reported exciting results on a project carried out with Leila Ali Cavasonza and Michael Krämer. 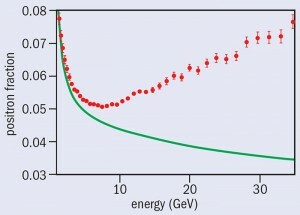 Indeed, AMS-02 has reported an excess in the measurement of the positron flux (red date points, left figure) compared to standard expectations from astrophysical sources (green curve, left figure). This has triggered a lot of interest recently. The reason is that anti-particles are an extremely interesting observable when searching for dark matter. Indeed they are rarely produced from standard astrophysical sources. Thus the discovery of excesses in anti-particles fluxes could be already a smoking gun for the existence of dark matter. 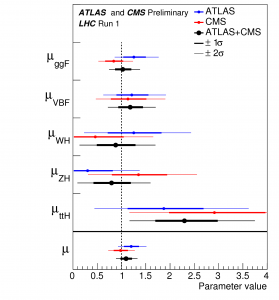 Nowadays, the dark matter contribution is believed to be sub-dominant in the AMS-02 observations. However, the absence of a “bump” – as expected from a from a dark matter signal – in the very smooth AMS-02 spectrum is a great opportunity to set limits on dark matter annihilation cross sections. We have derived new upper limits on the annihilation cross section using a new method that allows us to study dark matter with masses ranging from several TeV down to 1 GeV. 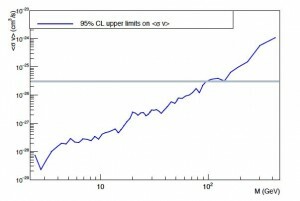 In particular we have focused on the impact of massive electro-weak gauge bosons on these limits. Even if their contributions are limited, they are of prime importance as they produce all standard model particles when decaying. I have thus shown that there is a promising complementarity between different fluxes of anti-particles. This opens up new ways to exclude or find dark matter in the next few years using indirect detection.